Looking for someone online? Lots of websites claim to offer people search services, but few offer real results. Back in September 2007, MediaShift’s Mark Glaser examined the emergence and functionality of online people search engines and looked at how they affect your privacy. A lot has changed since then. Facebook has become, in my opinion, the White Pages directory of the Internet age. At the same time, a lot of the people-search engines changed drastically. Many took a negative path by spamming their pages with undisclosed ads and making it harder to opt-out. Other took a more flexible (and better) approach by allowing you to easily manage your privacy while also still enabling you to be found. Four percent of searches are people search, but results are only satisfying 20 percent of the time." Below are the three key ways in which online people search has changed in recent years. White Pages directories usually list the names and numbers of various people. 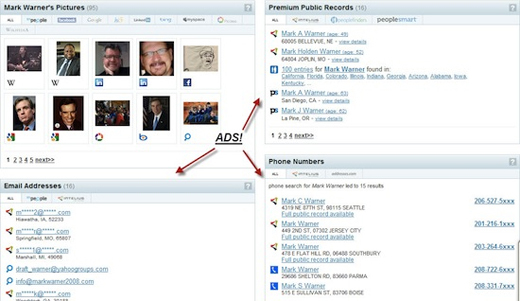 So how is Facebook the new White Pages directory? Let me answer that question with a question: What’s the purpose of telephone numbers? They enable you to contact someone. Can you do the same thing with Facebook? Of course! Most people use their real names on Facebook — one survey found that only 2 percent of Facebook users use fake names. The point is that today Facebook is now the closest thing to a true online white pages directory. Its 500 million users with mostly real names have transformed it into the Internet’s White Pages. As it continues to grow, that will only become more true. It’s the first site in history to have such a huge database of real names and an easy way to contact those people. And while you can only see contact info for Facebook “friends” who post their info on Facebook, you can also message nearly everyone else on the site. Two years ago I published an article, 25 Free People Search Engines to Find Anyone. 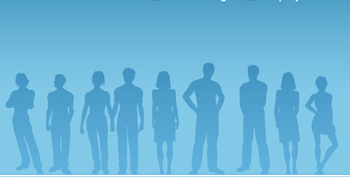 The purpose was to collect a lot of genuinely free resources for finding people online. Most of them were, indeed, not charging and not full of ads. You’re told you can find the person you’re looking for on Facebook or MySpace. 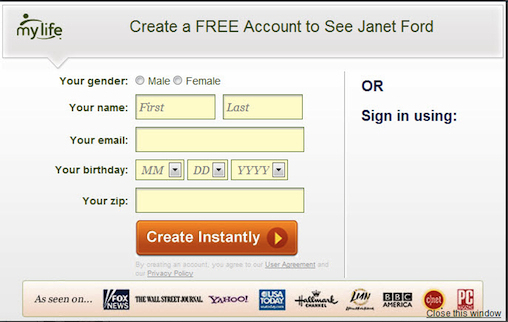 If you click on the name, however, you are prompted to register on a different site where they later offer you full access to that person’s profile for a fee. Scary stuff. Luckily, there are still some new and awesome free people search engines. One is KGBPeople. This is a new and growing service, so I hope they’ll stay free as they go bigger. Most people’s initial reaction after they go to a website that lists their private information is to think about how they can remove their entry from the site. The good news is most websites of this type offer an opt-out option to remove your personal information from their database. List your cell phone number but hide the actual number. If someone finds your listing and wants to contact you, she will be shown “send text message” link where she can send you a message via the WhitePages.com system without knowing your actual number. List your email but hide your actual email. It’s the same as above: The person trying to contact you will get a “Send email” link instead of getting your actual email address, as shown in the image below. Unfortunately, I haven’t seen any other big people search sites trying to do something like this. Instead, many of them make it harder for people to opt-out from their database. This creates a lose-lose situation in the long run. The approach by WhitePages.com solves one big problem: If you remove your personal information from their site, you’ll protect your privacy. But what if you have some long-lost friend who wants to get in touch with you? By removing your personal information you drastically reduce the chances you will be found by someone who genuinely wants to reconnect. By claiming a profile and controlling what is private and what is public, you eliminate this problem. Recently Google removed its phone directory search operator without giving an official report on it. The reason? A lot of users were shocked after seeing their full name and number listed there. What if Google did this instead: Offer an option for people to claim their profiles, and encourage people to do so by explaining the advantages of doing this, such as being contacted easily by people they haven’t seen for a long time. Would offering such an option have changed things? I think yes. The people search industry needs to think more about how it can better serve people while offering privacy and flexibility. According to Microsoft’s Yusuf Mehdi, four percent of searches are people search, but results are only satisfying 20 percent of the time. Unfortunately, not many people or companies are trying to improve this situation. Darren Mihajlovski has been in the people search industry for close to four years. His website, FinderMind reports on recent people search trends, as well as offering people search advice.